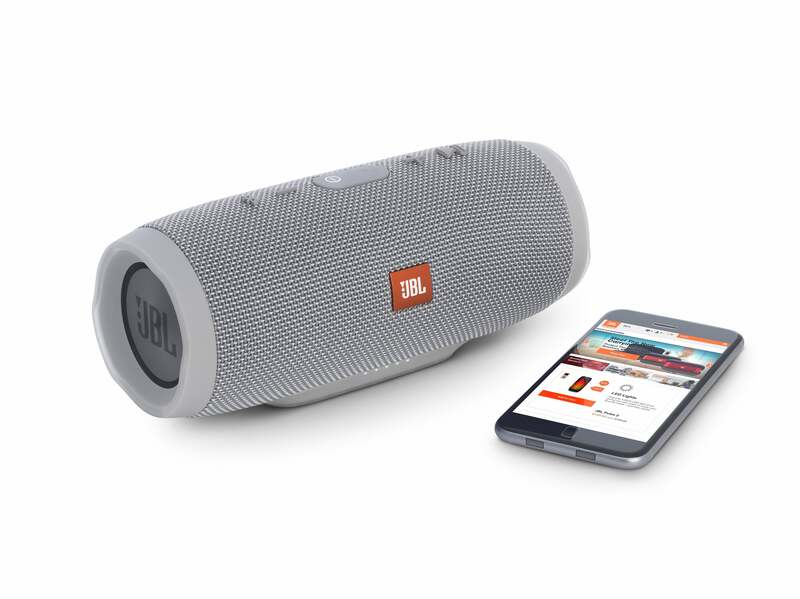 JBL has been one of the bigger names in portable Bluetooth speakers for a while now. In fact, the Charge 3 that’s the subject of this review is actually the fourth iteration: There was the original, the Charge 2, and the Charge 2+ previously. Throughout it’s all been about good sound and outrageous battery life. The Charge 3, with its 22.2 watt-hour battery, can run for an outlandish 20 hours. That’s probably going to outlast all but the hardiest partiers by a long stretch. Me? By about 18 hours. The Charge 3 I kicked the tires on was red, but it’s also available in attractive shades of aqua, dark blue, black, and light gray. It weighs in at around 1.76 pounds, and it ships with a USB charger and micro-USB cable. The actual dimensions are 8.3 inches long, and about 3.5 inches in diameter, but I was thinking of a slightly fat, rubber-covered thermos when I stood it on end. Excuse me “modern materials”, not rubber. The front of the Charge 3 with its highly recognizable logo. There’s a slightly extended flat area on the “bottom” of the Charge 3, so that the unit doesn’t roll about. Along the front edge of said flat area is a five-LED battery charge indicator, which you can see best in the next image. On the back are a micro-USB jack for charging the Charge 3, a standard USB port for charging other devices using the speaker’s battery, and an 1/8-inch jack for analog audio input. These are covered by a snug-fitting plug to keep water out. The controls are on top: volume up and down, Bluetooth pair, power, play/pause, and almost infinite (I’ll explain that later). The unit’s IP (International Protection Marking) waterproof rating is IPX7, which means you can submerge it under one meter of water for 30 minutes. Why you’d want to do such a thing is beyond me, but I haven’t been a teenager in a while. I get floating it about, or diving to the bottom of the pool for five seconds, but half an hour? More importantly, you can put liquid on the sound-radiating diaphragms on either end, and then watch it spray. Or you can watch the patterns ripple across the water as it floats. That’s a guaranteed two minutes of amusement right there. A front profile of the Charge 3 styled in ominous black. The controls are on the top and the ports on the back in this orientation. Note the charge indicator at the bottom. If I have any real complaint about the Charge 3, it’s the truly weak documentation supplied by JBL, or whomever is manufacturing it for them. 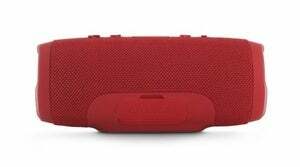 Anyone who’s used a Bluetoooth speaker before should be able to figure out the controls, but the only explanation in the user’s guide is a row of the same symbols used by the buttons themselves in a slightly larger size below their picture (plus a phone icon). I’d find it hilarious if I wasn’t imagining so many people’s consternation. Pressing and holding the Bluetooth symbol sets the Charge 3 looking for a Bluetooth media playback device to pair with; the plus sign increases volume and you can press and hold for continuous increase; the minus sign decreases volume with the same deal on continuous; the play/pause button plays and continues playback, but also answers and hangs up the phone. You’re welcome. The back of a red Charge 3 with the cover for the micro-USB, USB, and analog audio ports in place. There’s also a button with an odd symbol that I first thought indicated “almost infinite,” as pressing it lights up the charge meter. An inside JBL-joke about the run time? No, it’s for linking to other JBL speakers. Should they be hanging around and sporting this same linkable feature. More on that in the third installment of my leapfrogging discussion of that feature below. Okay, this sounds crazy, but the Charge 3 sounds best sitting sideways on your head with the speakers facing forward. I’m not kidding; another person shares that opinion, though it took the better part of five minutes to convince them to try it. Doing this aligns the speakers in relation to your ears so that you can actually hear some stereo separation—something the Charge 3, along with nearly every similar product, lacks. The speakers are simply too close together. My solution isn’t comfortable or practical, though I suppose I could come up with some sort of hat…. When at close quarters and placed anywhere more intuitive than the peak of your pate, the Charge 3’s sound is punchy, with just the right amount of bass for my tastes.There’s not so much as to overwhelm the music, or loosen the bolts on your patio furniture, but enough to get your feet moving. The high end was less satisfying; slightly subdued is the best way to describe it. 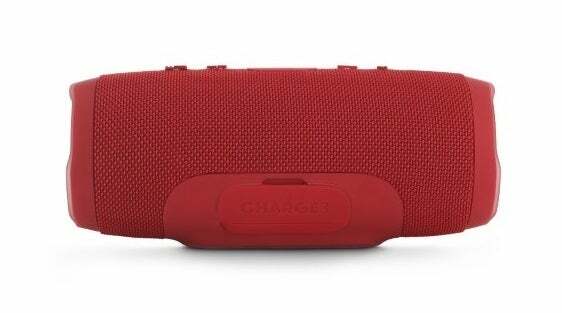 The end view of the Charge 3 and one of its weather-proofed diaphragms that pumps a lot of the bass out. JBL has perennially been about saturated mid-range. Some people find delight in that, but I find it tiring on the ears. 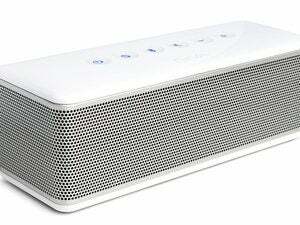 But mid-range cuts through the crowd and ambient noise; and as this is an outdoor speaker—that’s a good thing. You know that person who you can hear from the other side of the club, even when it’s full of loudly chattering patrons? That’s mid-range. One thing that surprised me about the Charge 3 is that it’s not particularly loud, though as I said, it still cuts through the ambient noise. I suppose I was simply expecting a bit more, given that it’s a bit larger than many of the speakers I’ve reviewed. The gray version of the Charge 3 with the distinctive JBL logo and a linked device. 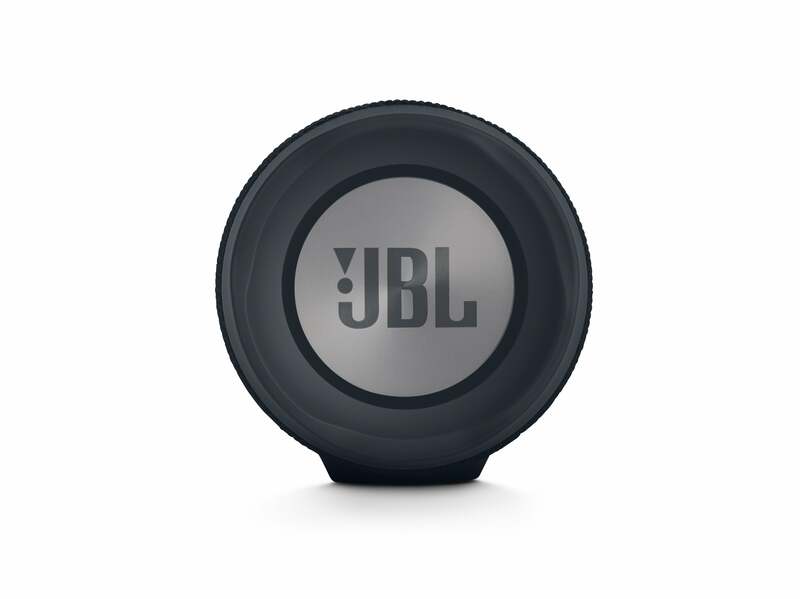 The third part of that almost infinite discussion: you can link JBL speakers (using the “almost infinity” button) to produce the same output over a broader area, and while the Charge 3 doesn’t adhere to the true wireless stereo (TWS) standard, it does have it's own version. 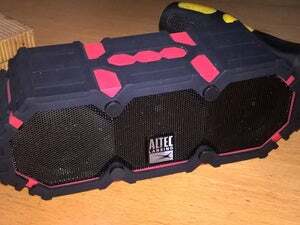 TWS lets you pair two Bluetooth speakers and use one for the left channel and one for the right. 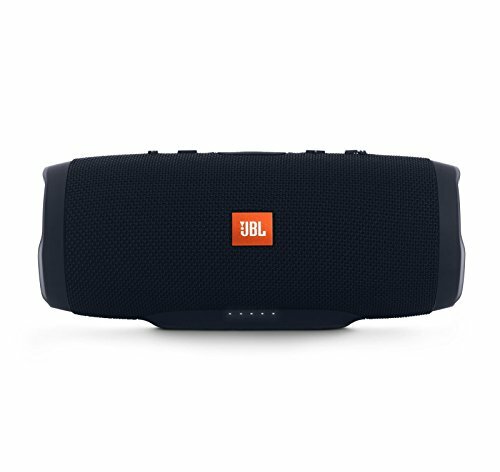 JBL's Connect requires its JBL Connect app, an extra step, but you wind up with the same result. I only had one unit with the feature, and was unable to test this facility, but its mere purported existence takes care of most of my separation anxiety. The Charge 3 is one of, if not the longest-lasting outdoor Bluetooth speakers you can buy. 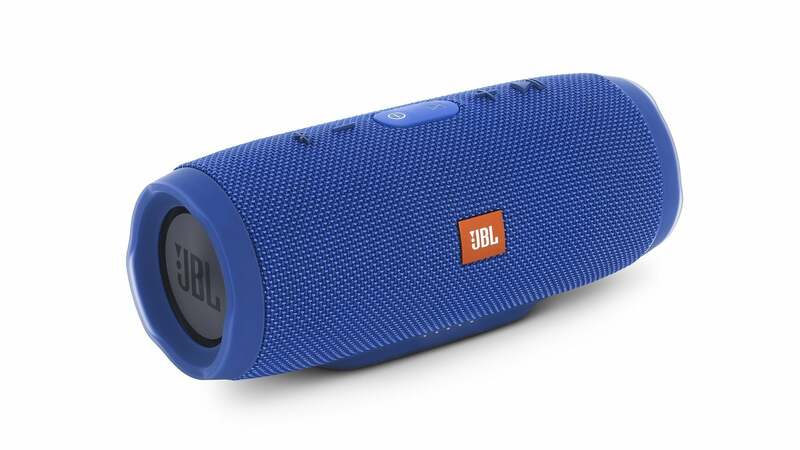 And despite my petty delving into audiophile sound concepts, many users love the sound of JBL. Bless em’. If that’s you, take a listen to this one. You’ll love it as well. Note: This article was edited 6/29/2016 to amend the the stereo pairing discussion. 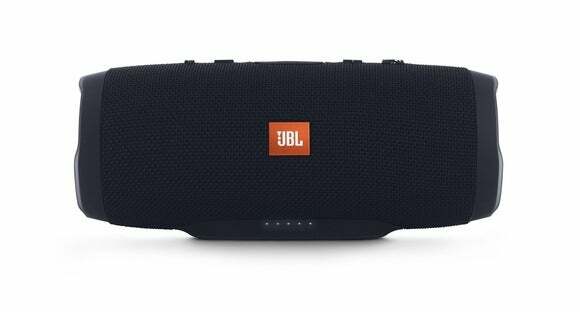 A whopping 20-hour run time, IPX7 waterproofing, and thumpy bass highlight this outdoor Bluetooth speaker from JBL. 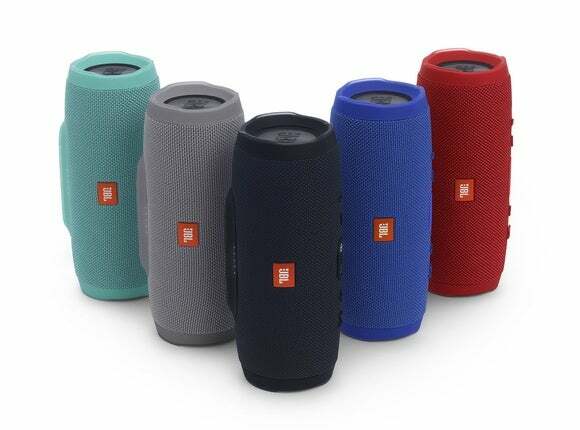 It has that JBL sound that many users love, and can also link to other JBL speakers to cover a larger area. Audio lacks clarity and separation.